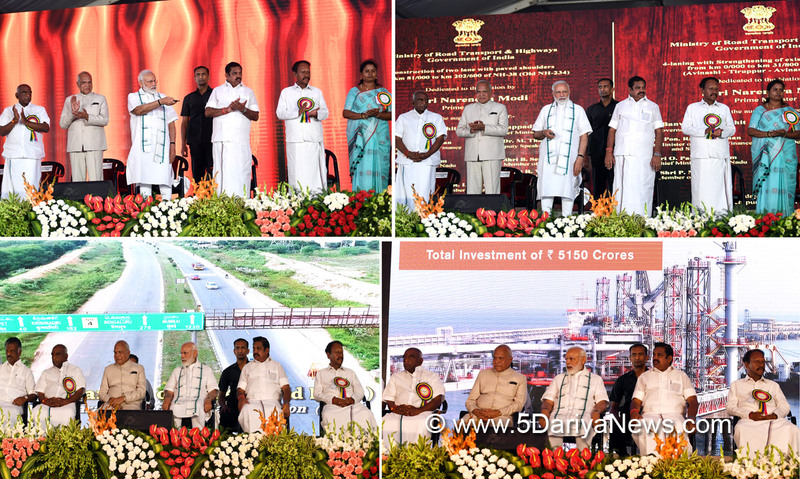 Prime Minister Narendra Modi on Wednesday unveiled various infrastructure projects in the energy, road and railway sectors in Tamil Nadu.Modi dedicated to the nation the much-awaited Rs 5,150 crore liquified natural gas (LNG) terminal at Ennore. The LNG terminal with a capacity of 5 MMTPA will help in meeting the LNG gas demand in Tamil Nadu and neighbouring states and is expected to spur the development of upcoming city gas distribution networks in Chennai, Tiruvallur, Coimbatore, Salem, Kanchipuram, Ramanathapuram and others.The LNG will be transported to customers enroute by pipeline up to Thoothukudi via Puducherry and Trichy. Another pipeline is being laid to Bengaluru via Hosur to take LNG to industrial customers.Prime Minister Modi also laid the foundation stone for the four-laning of Vikravandi-Sethiyathopu section, Sethiyathopu-Cholopuram section and Cholopuram-Thanjavur section of National Highway (NH) 45C and six-laning of Karaipettai-Walajapet section of NH 4.He also laid the foundation stone for the widening and strengthening of carriage ways and culverts on NH 234.Modi dedicated to the nation the four-laning and strengthening of carriageway of Avinashi-Tirupur-Avinashipalayam section of NH 381 to the nation.The road projects are worth about Rs 5,010 crore.In the railways sector, Modi dedicated the electrification of Erode-Karur-Tiruchchirapalli and Salem-Karur-Dindigul railway lines to the nation.